Pizza is a popular comfort food enjoyed throughout the world and over the years it has grown into the stature of global food with every region churning its own version. Today, you can find host of popular, global, and local pizza joints in every city and they are always competing with each other to increase customer base. They all work hard to dissect and resurrect their faltering marketing strategies to accommodate more customers. 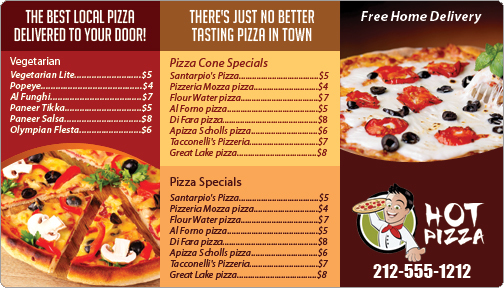 And you can see the results by yourselves because flyers, pamphlets or menu cards are gently replaced with their magnetic counterparts – aka pizza magnets. Another great thing about these pizza magnets is – unlike pizza promotional flyers or menu cards you may not end up throwing them the very moment they are handed out at a joint. Pizza Coupon Cards and Menus – You can refer all hot deals of the day and exotic, regular and special menus strutted out by the pizza parlor. Usually printed on wider vinyl material, pizza menus and coupon cards have broader appeal than regular promotional magnets and often show up easily against any ferrous surface. Pizza Fridge Magnets – This is the common umbrella term used to refer large number of advertising magnets dished out by pizzerias. They can personalize it with regular information such as brand symbols, contact details or it can be used for announcing some special information regarding discounts, special offers, etc. 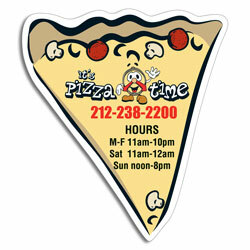 Pizza magnetic cards are gentle variations of this card and they too serve the same purpose. Pizza Calendar Magnets – It possess high retention value against investment. Yummylicious pizza magnets with dates and interesting brand symbols imprinted against them make a good refrigerator art isn’t it? Pizza Squares Magnets and Pizza Slice Magnets – You are most likely to get any of them during your next trip because they are visually “yummylicious” and will keep you boosted for a long time. A pizza slice magnet triggers visual appeal and it may kick start your appetite and transform your refrigerator door into an interesting space. Doesn’t that sound as interesting as a pizza itself? Jumbo Supreme Magnets – They offer you jumbo view of pizza menus, working hours, contact details and a great feeling of being near you whenever you yearn for a neat smack down of pizza. Pizza Business Card Magnets – Do they need an introduction? Simply talking they are going to encourage you to dial away those appetizing 10 digits for grabbing free home delivery of hot piping pizzas. Pizza Sports Schedule Magnets – They boost your appetite as well as spirits during sports season. Ooh two joys at one go! Pizza Car Magnets – Most effective way to tickle many taste buds during a neat drive through crammed roads! The list is simply unending because pizzerias are finding new ways to magnetize their business through pizza magnets.